a thing occured to me. Could it be that the crowned man in the segno of the Getty manuscript would not be Fiore, but Niccolo III. 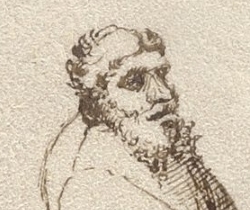 Fiore was an old man at the time the treatise was completed, roughly in his early 60s, whereas Niccolo was in his late 20s. It is hard to tell for sure, but to me the segno looks like a man in his prime. Sites like Wikipedia and Wiktenauer seem to offer the segno as a portrait of Fiore, but what is the basis for this assumptation. Some time ago I found a painting of young Niccolo III d'Este sporting a beard (in the room of the captains of Palazzo Guerrieri in Mantua), and it is not that dissimilar from the segno portrait. It is nothing ground breaking, or hardly a proof in one direction or the other. But for me this similarity between the segno and the portrait of Niccolo stands as a reminder that there are all sorts of things we have learnt to take for common truths in HEMA, out of habit. I have always thought of it as a generic gentleman. Getty may not have been produced in Fiore's presence - it's likely to be a second-generation reproduction produced in Ferrara - as such, it may well be supposed to represent Niccolo III. I don't now of any evidence to suggest that Fiore ever met Niccolo III. I actually think Fiore might feature as one of the gentlemen performing the plays, going through the Getty at the moment alot of the same men come up in the plays but they are staggered out. I don't believe that Fiore sketched this himself, I believe that there were 2 or more artist working on the Getty. You can tell by how some lay down the line work and some don't, details like how they draw the hands and others had a better concept of perspective. This all might point to one artist getting better overtime however as there is no way of knowing in what order it was created in. However I would speculate that at least one side of a folio page was worked on at a time. My other thought is that this was done of an evening in torchlight, as I suspect Fiore's day job as sword master would take up his time; this would also account for some harsh shadows and the two light sources coming from the walls. Now I would think that although Fiore was not drawing these himself he would be overseeing them to confirm they were accurate. He is obviously using helpers, students or servants for the poses most of whom appear to be young. On occasions we have much older gentlemen with beards featured. Likely these were done over the course of months, with arranged nights to get people together, the artist would be lucky to complete 2 plays of an evening. Now getting everyone together just like today would not always be possible, late cancellations etc, Fiore probably had to step in. The two plays at the top feature the same two guys, wearing different cloths. Giving the awkwardness of the play there was probably a lot of rest periods, so probably done over two nights. In the 3rd play in the bottom right you have a vary old gentlemen, possible Fiore himself, from the profile I believe the man next to him is the same man in the 4th play. He is wearing the same cloths so possible done on the same night, maybe the guy on the left was late and Fiore stepped in. This page was done by the same artist from looking at the details mentioned earlier, I would suggest this page alone was done over the course of 3 or 4 sessions. TyHar7 wrote: In the 3rd play in the bottom right you have a vary old gentlemen, possible Fiore himself, from the profile I believe the man next to him is the same man in the 4th play. He is wearing the same cloths so possible done on the same night, maybe the guy on the left was late and Fiore stepped in. You mean the bottom left? 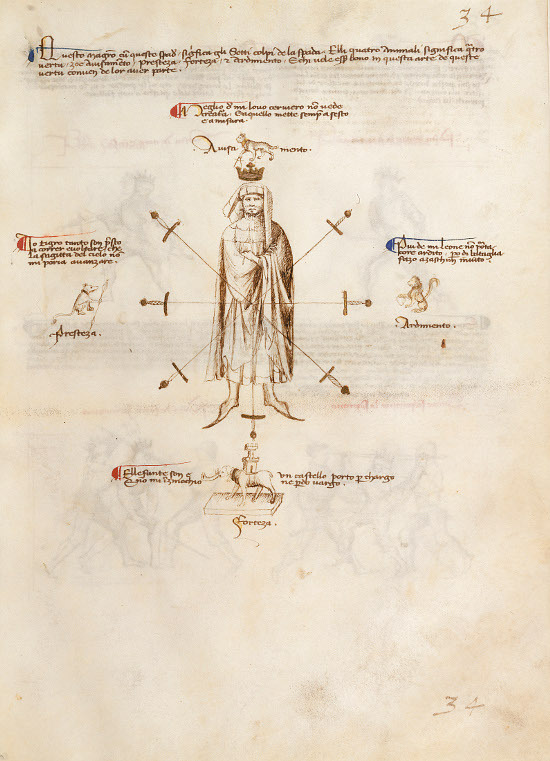 In the Pisani-Dossi manuscript you can find a same looking old man in all of the plays of the sword in two hands. Notice the similar forked beard style. Yes sorry the left, certainly this gentlemen appears fairly frequently. I must admit that I have always thought of the old man with the forked beard as Fiore, though obviously there is no hard evidence to support that. The light source question is an interesting one. On one hand, yes, the evidence suggests two or more light sources, such as candles or windows in a room. However, I did A-level art and studied Architecture for two years at uni, and I have seen a lot of not-very-good artists draw things and insert their own imaged shadows and light sources to make a picture look better (to them), without reflecting reality. It is a sort of noobish thing to do and not rare. Joeli wrote: Sites like Wikipedia and Wiktenauer seem to offer the segno as a portrait of Fiore, but what is the basis for this assumptation. For the record, I never said it was a portrait of Fiore. I just threw it up there as a placeholder because it made the article look better. This point has been discussed before. It seems pretty obvious that the shadows are there to clarify the position of the body and are usually not related to reality.